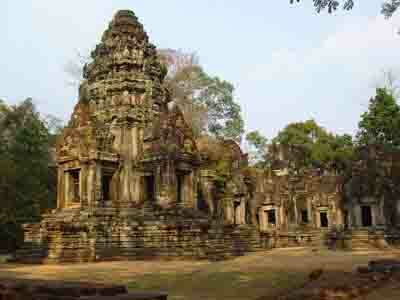 Small, attractive temple in very good condition, built at the same time as Angkor Wat. 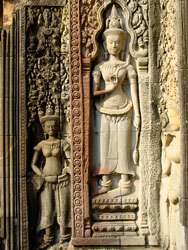 The Angkor Wat style is most easily seen in the style of the towers and carved devatas. Thommanon seems to stand in conjunction with Chau Say Tevoda across the street, but was built decades earlier. 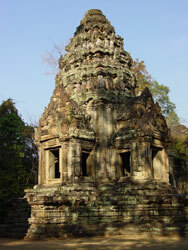 Thommanon is currently in much better condition than Chau Say Tevoda, in part because archaeologists heavily restored it in the 1960's. But even before restoration, Thommanon was in better shape thanChau Say Tevoda due in part to the lack of the stone-enclosed wood beams in Thommanon’s super-structure that were used in Chau Say Tevoda’s construction. Many of Thommanon’s carvings are in excellent condition. 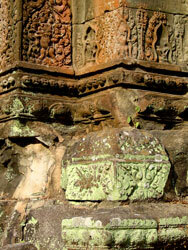 The colors of the age stained sandstone against the jungle are very photogenic, particularly in the wet season.